My breakfast. Best pancakes I have ever eaten. Not sure what they do to them but they were SO good. Like eating cake. From there we ventured off to ride around a bit. Check out our new ride. With the sites done we stopped to have our pic made. Later to the marina. So much fun. This family had just came in with their catch of the day. Yep...they got a shark. I have a folder on Facebook titled Street Art and I have just really started to take pics for that folder. Although I found some I took years ago before digital. Had to scan the first two. Downtown Nashville Also, downtown Nashville. Now we are into the easy way... DIGITAL! Took this on a backroad in TN...somewhere! 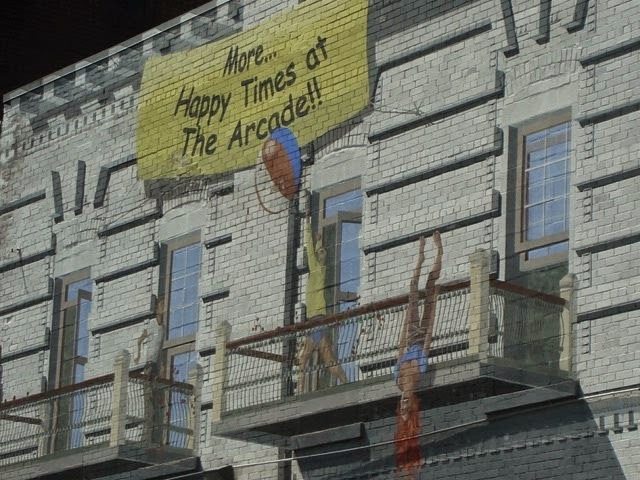 This is on the side of a building in Donelson Tn. Couple of Cities over from me. This was painted by a group of people on the side of a furniture store in Donelson. Also in East Nashville at a church day care. Ventured out for this one! Street Art in DelMar Calif. Course this was on the 4th of July so this street art was dressed! Amazing work by Major Hall, local artist. This is his street art, his mailbox! Leepers Fork in Tn. This is why I am going to learn to weld. I love this stuff. I have always wanted to be able to quilt but as it is I have WAY to MANY other things that I mess with....quilting is not one. But my sis in law Lori does an amazing job. She took it up less than ten years ago and just ran with it. She has made so beautiful quilts and bless her heart, with all the work she does on them she gives them away. 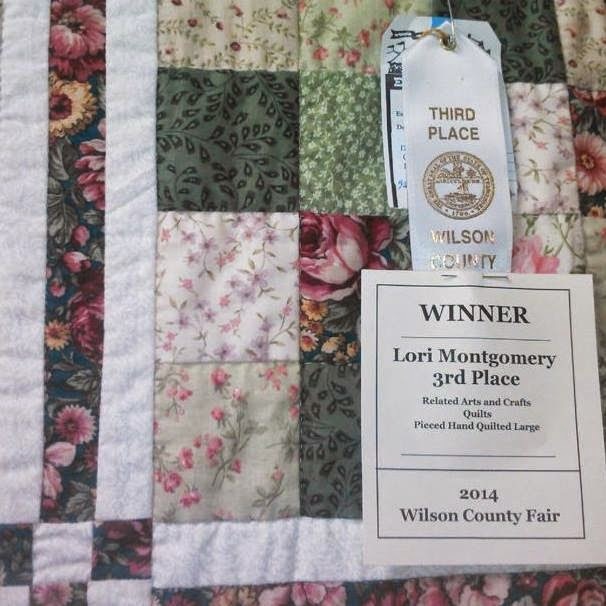 This year she decided to enter a couple in the county fair and look what the full size quilt placed. 3rd place! First time ever to enter... Not only did she put the full size quilt in there she put a lap quilt in there also and it got 2nd place! I am so proud of her and her work. Way to go Lori. Here is another that she gave to a woman fighting cancer. Is that not just amazing? Tuesday August 12th, 2014 I got up at 3am....Yes, you read correctly! Why? VACATION TIME and someone likes to get an early start. 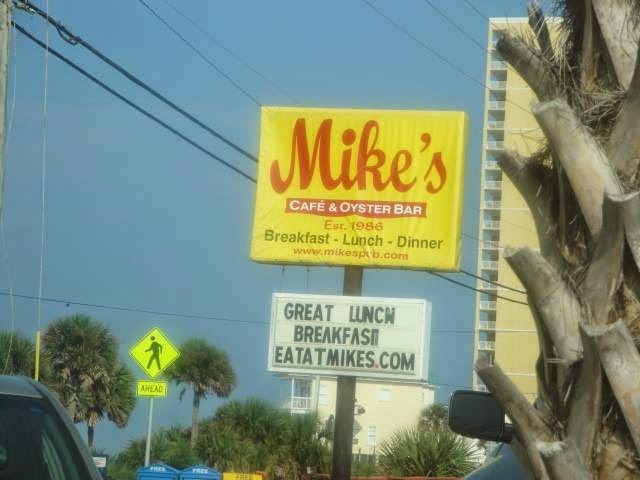 I was excited also since I have never been to Panama City Beach Fla. Our hotel. View from the room... nice huh? And watching the fun. Love the volley ball I also caught in this shot. Resting after the walk on the beach.